Capsular contracture (CC) is the most common complication following breast augmentation surgery. CC is the most common reason New York City patients with breast implants request additional surgery. By far, the best treatment for capsular contracture is its prevention; however, to date, there are methods to reduce but not eradicate its occurrence. Plastic surgeons do not currently know all of the causes of capsular contracture. Dr. Greenwald utilizes the latest techniques to try to keep the incidence of capsular contracture to a minimum for his patients (< 2%). Dr. Greenwald is up to date with the latest techniques in breast augmentation and also in the treatment of capsular contracture. Capsular contracture is a progressive hardening of the breast after breast implant surgery. It often has a slow onset (slow, progressive hardening) and can occur at any time. It can occur in one or both breasts. CC is typically graded or scored based on severity. The most commonly used grading system was developed by an Orlando plastic surgeon several decades ago. While we do not know the cause of capsular contracture, most of the current data (and recommendations) to reduce the risk of CC point to an infectious etiology. Left breast is firm and visible abnormal. Patient has had recurrent episodes of CC prior to seeing Dr. Greenwald. Left breast is firm, visibly abnormal and painful. Initial breast surgery at outside plastic surgery facility. What can be done to reduce the risk of capsular contracture? Submuscular positioning of implants reduces the rate of CC. 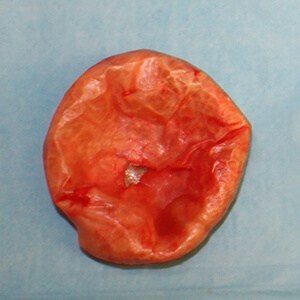 Meticulous surgical technique and minimizing bleeding during and after surgery reduces the rate of capsular contracture. Drains are never used and pinpoint cautery is used to control bleeding. Antimicrobial irrigation during surgery may reduce the rate of CC. This likely helps sterilize the surgical pocket the implant will be inserted into. Use of an implant insertion device such as the Keller Funnel® may reduce the rate of CC – utilization of a “no-touch” technique. This reduces possible surface contamination of the implant by allowing rapid insertion of the implant with minimal trauma and avoiding contact of the implant with the patient’s skin, surgical drapes or instruments. Minimize postoperative activity. You will likely feel good within days of your surgery but it is important that you rest and take it easy. You will be allowed to return to the gym 4 weeks after surgery. Dr. Greenwald believes that return to vigorous activity before the capsule has properly healed may result in small tears in the healing capsule which may lead to CC. Postoperative Implant Massage may or may not help reduce the risk of capsular contracture for implants in a submuscular position. With that being said, Dr. Greenwald has all his patients massage their implants beginning one week after surgery. Though it may not help prevent CC, it may often help a patient identify an early CC which may be treated medically (see below). What can be done to treat capsular contracture? First and foremost, the best treatment of CC is to minimize its occurrence as outlined above. For an early CC (a contracture often noted by the patient while massaging her breast implants), several medications may be useful to help soften the breast. Leukotriene inhibitors such as Singulair and Accolate have been of benefit especially when paired with a low-dose antibiotic such as doxycycline. Several studies have shown these to be of benefit in treating and preventing CC. I often give my own patients with Grade II contractures a trial of these medications before opting for surgery. For a Grade III or IV CC or a Grade II that is bothersome to the patient and unresponsive to medical management, surgery is the best option. For patients with subglandular implants, a change to a submuscular position and removal of the subglandular capsule is the treatment. This “pocket change” is often very successful. We often recommend a course of Singulair and an oral antibiotic for 3 months as well. Aggressive massage is also started early. En bloc removal (total capsulectomy) of encapsulated silicone implant. Strattice placed in lower pole of breast after capsulectomy. 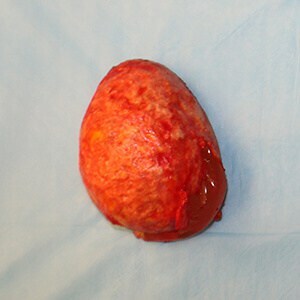 Patient’s left breast remains soft and supple..
Strattice placed in lower pole of breast after capsulectomy. Patient’s left breastremains soft and supple. It is important to note that capsular contracture may come back after surgery in approximately 30% of cases despite taking the proper measures before and after surgery. Use of an acellular dermal matrix (ADM) such as Strattice reduces the recurrence rate to approximately 5%. In patients seeing Dr. Greenwald for opinions regarding recurrent CC, he prefers to use Strattice in these cases. Strattice and other ADMs seem to stop the scarring of capsular contracture wherever the Strattice is placed. If the scar tissue does not have the ability to encircle the implant, the implant remains soft and supple! Dr. Greenwald is happy to be able to provide his expertise on capsular contracture to patients in NYC, Westchester County and Fairfield County, including Greenwich and Stamford, CT. To learn more about capsular contracture, please schedule a consultation by calling (914) 421-0113 or (212) 518-1642 today.